Graphite is known as the most stable form of carbon that is found under standard conditions and because of this it can be found in a series of different types of applications from brake linings and pencils to use in steelmaking and electric motor brushes. Also known for its very high melting point, graphite makes for a great material to use in permanent molding processes in the manufacturing world. These high quality industrial molds can be made from graphite blocks, which are then tooled and fabricated into a detailed mold; molten material is then poured into the mold and allowed to harden. This harden material is then brought through secondary finishing processes, but is generally in the final shape once it leaves the graphite mold. Graphite blocks allow for an individual or company to produce their own graphite products such as graphite molds or any other form of graphite based product without having to go through the process of getting the graphite from its natural state into a block form which is easy to work with. Graphite block suppliers typically offer a wide range of sizes when it comes to their blocks, obviously the size of the block that you will require is heavily dependent on your unique application and tooling process. 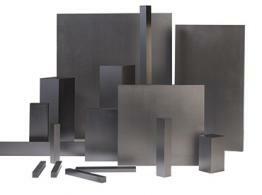 As stated before the use of a graphite block has a very wide range and graphite suppliers work with a number of different industries in order to provide graphite blocks for applications such as run out plates, heating elements, furnace parts, boats, gas nozzles, brazing fixtures, runners, batteries and so many other applications. Finding the right graphite block manufacturer comes down to evaluating your needs and requirements and bringing them to a number of different suppliers in order to determine which supplier is a good fit for you and your application. While the graphite is typically the same at each supplier, the sizes which a supplier can provide range from business to business with some even offering custom saw-cut sizes in order to ensure that you find the right sized graphite block for your application. Graphite Block Graphite is utilized in a number of different applications and industries due to its advantageous physical properties, and one of the best ways to purchase graphite for some applications is to simply buy graphite blocks from a graphite supplier.